Need a table inside of a text box? Want your table to flow to the next page? We've got you covered! There are times where you'd like to include your table inside of a text box and save yourself from having to reposition tables in your proposal. There may also be times where you have a large list of fees, and you'd rather just focus on getting the information on the page. We've made it easy for you to do either (or both) of these with a couple of clicks. 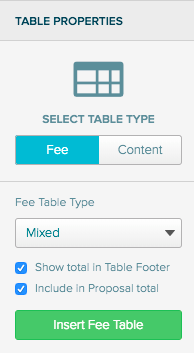 Embedded (or Inline) tables function just like regular fee tables but are placed directly inside of a text box, rather than added overtop. 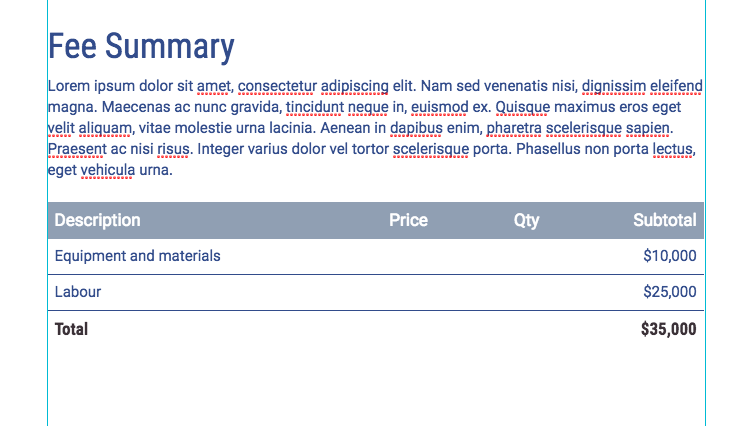 This allows you to have a table treated like any other piece of text in the box, moving downward/upward as you add/remove text and other elements. This is the most important step. If there is no blinking cursor, then the table will be added over-top of the text box and won't flow.